The earliest Mother’s Day celebrations we know of were ancient Greek spring celebrations in honor of Rhea, the mother of the gods. But those were in honor of one particular mother. England’s “Mothering Sunday,” begun in the 1600’s, is closer to what we think of as “Mother’s Day.” Celebrated on the 4th Sunday of Lent, “Mothering Sunday” honored the mothers of England. In 1907 Anna Jarvis started a drive to establish a national Mother’s Day. In 1907 she passed out 500 white carnations at her mother’s church in West Virginia – one for each mother in the congregation. In 1908, her mother’s church held the first Mother’s Day service, on May 10th (the second Sunday in May). That same day a special service was held at the Wanamaker Auditorium in Philadelphia, where Anna was from, which could seat no more than a third of the 15,000 people who showed up. By 1909, churches in 46 states, Canada and Mexico were holding Mother’s Day services. In the meantime, Ms. Jarvis had quit her job to campaign full time. She managed to get the World’s Sunday School Association to help; they were a big factor in convincing legistlators to support the idea. 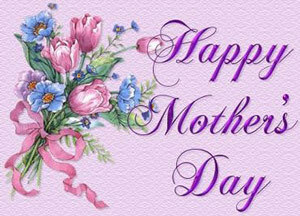 In 1912, West Virginia was the first state to designate an official Mother’s Day. By 1914, the campaign had convinced Congress, which passed a joint resolution. President Woodrow Wilson signed the resolution, establishing an official national Mother’s Day on the second Sunday in May. Many countries of the world now have their own Mother’s Day at different times of the year, but Australia, Belgium, Canada, Denmark, Finland, Italy, Japan, and Turkey join the US in celebrating Mother’s Day on the second Sunday of May. Britain still celebrates Mothering Day on the 4th Sunday of Lent – but they now call it Mother’s Day. By any name, and at any date, it’s a special day to honor a special person.